Recently we had the chance to try out one of the cutest sets of headphones out there: CozyPhones. These kid-specific headphones are a soft, fleece headband that has a pocket inside which holds flat speakers over the ears. CozyPhones Kids Character Headband Headphones come in all sorts of different animal styles, including unicorn, bunny, fox, panda, frog, monster, & cat. There's also a set of Paw Patrol characters if you have any small fans of that show in your home. 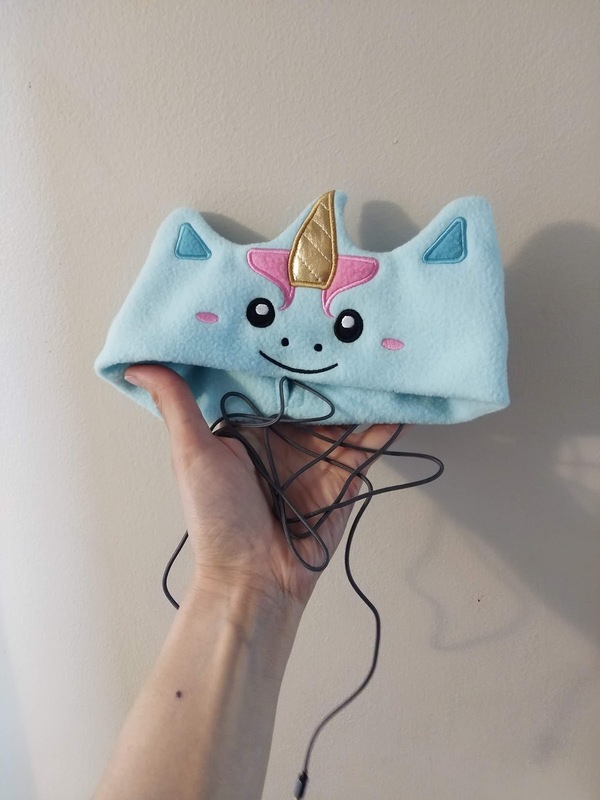 I actually came across CozyPhones about a year ago when I was looking for something I could wear to bed to help me sleep without having anything inserted in my ears. This is basically the origin story of the CozyPhones company: Paul, a veteran, had trouble sleeping & getting back to sleep at night, so he was looking for something to wear in bed to listen to podcasts or music. After finding a lot of expensive & fragile options out there, he decided to design his own & CozyPhones was born. Along the way, he added a children's line, with characters designed by his daughter. CozyPhones have also become a useful alternative to earbuds & headphones for children with cochlear implants, or for kids with sensory sensitivities. The Kids Character Headband Headphones work the same way as the adult ones, with speakers inside a band that lays flat around the ears, so they're comfortable to sleep in, even for side sleepers. I like the fact that they're mostly soft for durability. B is very hard on electronics & has broken other styles of kids headphones in various places. The flexible fabric band of CozyPhones is something she can't break, thankfully! The headband comes in one size, which fits my biggish-noggined kids (age 4.5 & 7.5). The braided cord is about 90cm long, coming out the back of the band & the stereo plug is the usual 3.5mm. If your child sleeps with headphones, or you travel a lot, these headphones are pretty fantastic. The main downside is that they could potentially be too warm for kids who 'run hot' or warmer climates. The headphone part inside the headband is also not fixed--you can easily adjust the position of them, but you can also pull them right out of the band at the opening in the back. CozyPhones Kids Character Headband Headphones currently retail for $18-22 (US) online. For more information on the kids headphones, or the adult version, visit the CozyPhones website, & check them out on Instagram. "My son has cochlear implants and with the placement of them we thought it would be impossible for him to be able to use headphones. Thanks to cozyphones that’s not the case! 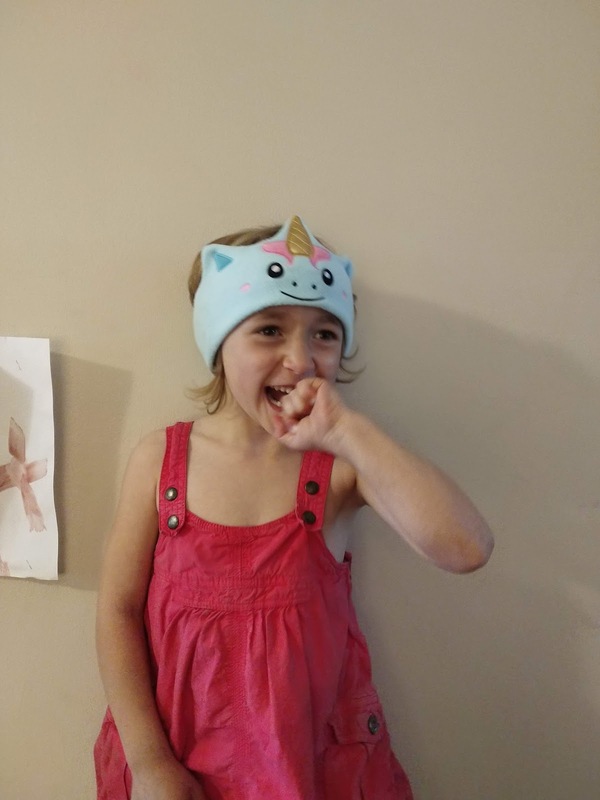 Thank you so much 😊" - Maria C.
Disclaimer: I received a set of unicorn CozyPhones Kids Character Headband Headphones to facilitate this review, but was not otherwise compensated for this post. Opinions are my own!